Candlemas is a very old holiday with a Christian-Pagan history. Its Christian version is called the Purification of the Virgin and is the end/culmination of the forty day period after Mary God-Bearer had her baby on December 25. Women had to wait forty days after childbirth before entering a church or Temple again due to "uncleanliness". This waiting period is still observed in Eastern Orthodox Christian churches today, and all Christian churches schedule the Christening for forty days after the birth in keeping with this ancient purification practice. Therefore today is Yeshua’s Christening or Naming Day when an exorcism is performed and the baby formally enters the Church. This special forty-day period in the Christian calendar is one of four such in the esoteric Church year. The other three forty-day periods are: Fall Equinox (Sept 21) to Halloween/AllSaints Day (Oct. 31, Nov.1), Spring Equinox (Mar 21) to May Day (May 1) and of course, Lent. Lent is the forty-day period beginning on Ash Wednesday and ending on Easter Sunday every year. Candlemas is a church “adaptation” of a pagan goddess holiday called Imbolc where people light candles to banish dark spooks. Candlemas is celebrated on the same day as that pagan holiday, February 2nd. The word Imbolc, variously spelled Imbolg, Oimelc and Imelg, means “ewe-milk” because this is the time lambs were born in old England, Ireland and most of Europe thus bringing back the flow of ewe’s milk. Today (tomorrow, according to some calendars) is the day of Candlemas, the Festival of Lights, a Midwinter Festival. Known to Neopagans and ancient Celts as Imbolc (Gaelic origin, “in milk” or ” in the belly”), a festival of the Maiden Goddess and a traditional time to bless agricultural implements (especially the Plough) and livestock. Neopagans celebrate the holiday with home blessings and lighting candles to welcome the coming of the light and the Goddess in Spring. crosses” are fashioned from straw. 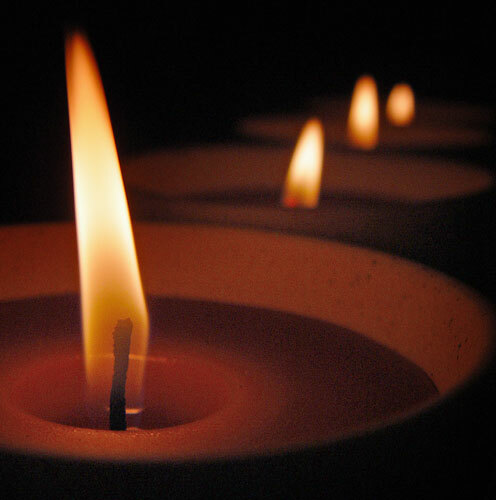 On February 2nd we ask that all members of our Church of the Way and Ekklesia Epignostika light a candle at their altar and carry it across the room to put in a window. ‘Tis a simple but powerful rite that acknowledges today as a holy day going back 5000 years. You may light more candles if you’d like, the more the better. 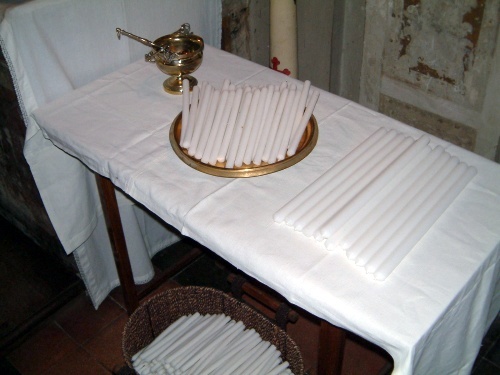 See the picture below for how many candles Christian churches get ready for this day! All over Europe Candlemas was considered one of the great days of weather forecasting. Popular belief claims that bad weather and cloudy skies on February 2 mean an early and prosperous summer. If the sun shines through the greater part of Candlemas Day, there will be at least 40 more days of cold and snow. This superstition is familiar to all in our famous story of the groundhog looking for his shadow on Candlemas Day. Imbolc is closely associated with the Celtic-Irish goddess Brigid. Imbolc is sacred to Brigid because she is a goddess of fire, of poetry, and of healing, all things that go along with the creative powers of the onset of spring. She is a powerful representation of the Maiden Goddess, and she has been almost perfectly preserved for us today by none other than the Roman Catholic Church. Rather than call her demon and risk the displeasure of all Ireland, they canonized Brigid and made her the patron saint of poetry and healing. This appeased the Irish, who at the time probably saw the Catholic saints as being very similar to gods. There is one very well-known tradition of Imbolc, and that is the tradition of the groundhog’s shadow predicting our weather. If a groundhog came out of its hole and saw its shadow, that meant six more weeks of bad weather. This tradition is still widely celebrated today. Another tradition is to put a candle in your window on Imbolc Eve, representing the Eternal Flame of the Maiden Goddess. In Myth and Ritual in Christianity, Alan Watts says about the Feast of the Purification observed in Catholicism, and by Anglicans and Lutherans: "Finally, the rites of the Incarnation reach their climax with the Feast of the Purification on February 2nd, otherwise known as Candlemas. For at this time the Church blesses all the lights to be used in its ceremonies thruout the year, since it was at Christ’s Presentation at the Temple that Simeon called him "the Light to lighten the Gentiles, and to be the glory of thy people. "…As the choir chants…all the clergy and people assembled for Candlemas receive the blessed candles before the altar, and then go in procession with them around the church, singing: O daughter of Sion adorn thy bride-chamber and welcome Christ the King: greet Mary with an embrace, who is the gate of heaven, for it is she who bringeth the King of Glory, of the new light. … During the mass that follows, all hold their lighted candles during the chanting of the Gospel" and various other times in the ceremony. Roman: CERES and PROSERPINE; LUPA. (Mosheim, Eccl. Hist. Vol. Il. p. 51) “the list of festivals for the whole Christian church was swelled by the consecration of the day [February 2nd] of the holy virgin Mary, that the people might not miss their Lupercalia, which they were accustomed to celebrate in the month of February.” Note by Soames: “This was instituted in the reign of Justinian, and fixed to the second of February . . The Latins called it . . Candlemass; because many candles were then lighted up; as had been done on the Lupercalia, the festival of Proserpine, whom her mother Ceres ‘searched for with candles . . See Hospinian, de Fest. Christ, p. 52. (Whistler, English Fist. p. 86) “the early Church instituted on February 2nd the Feast of Lights, blessed her candles, placed by the altar in sheaves, and filled her basilicas with candleshine . . ‘Thus’, said the Pope, ‘what was done before to the honour of Ceres, is now done to the -honour of the Virgin’. (Foot-note) Quoted by William Hone, The Every-Day Book, Vol. 1 Col. 202”. JUNO FEBRUA, The Purifier. (Brewer, Dict.) “Candlemas Day. . It was the old Roman custom of burning candles to the goddess Februa, mother of Mars, to scare away evil spirits”. 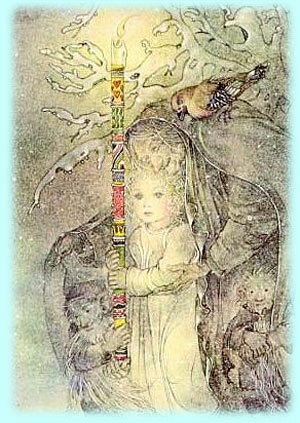 Click on the image on the right to read a modern pagan take on Imbolc/Candlemas. “Candlemass is when we come spiralling out again from the darkness, and our matriarchal symbol, the spiral, seems to recur in many aspects of Brigit’s cult. The dynamic shape of’ her crosses, the curling coats of her sheep and perhaps even the twisted patterns in Aran wool, handed down from mother to daughter, are part of her”. British-Roman: SUL-MINERVA. (B. Morgan, id.) “Sul-Minerva of Bath seems to be identical with Brigid; a goddess of knowledge and healing with an ‘ashless fire’ in her sanctuary. If Sul, whose name derives from the Celtic words for the eye (i.e. suil) and seeing, is cognate with the Goddess of Silbury Hill, there could well have been a procession at Candlemass to her sacred spring, the Swellowhead, which begins to flow again in February, when the Queen ‘comes from the mound’ “. English: THE WIVES. (Esther Harding, Woman’s Mysteries, p. 131) “In the north of England . . Candlemas used to be called The Wives Feast Day because it was regarded as a fertility festival”. General: THE WITCHES, Great Sabbat. (Doreen Valiente, ABC of Witchcraft, p. 98) on Druidic links with Witchcraft: “the Great Sabbats of the witches are identical with the four great yearly festivals of the Druids in Celtic countries; namely Beltane (30th April), Lughnassadh (1st August), Samhain (31st October) and Imbolc or Oimelc (2nd February)”. Jewish: THE VIRGIN MARY. (Esther Harding, Woman’s Myst. p. 130) “Another ancient festival of candles celebrated long ago for a moon goddess is now repeated on the same date, February the second, for the Virgin Mary, Moon of our Church. . This is the Festival of Candlemas. It corresponds in date and customs to the Celtic Holy Day of St. Bride or St. Brigit. 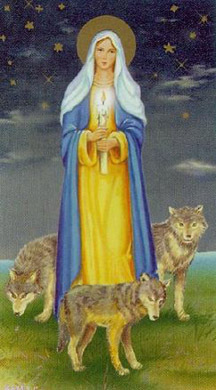 St. Brigit is the Christianized form of the ancient Celtic goddess Bridgit or Brigentis, a triune moon goddess whose worship was at one time very widespread. On February the first, as today in the Catholic Church at the Festival of Candlemas, the new fire was kindled and blessed”. (Whistler, English Fest. p. 87) An extract from an account written by a prebendary of Durham, in 1628, of John Cosin, bishop’s chaplain, later Bishop of Durham: ” ‘On Candlemas Day last past, Mr. Cozens, in renuing that . . ceremonie of burning candles in honour of Our Ladye, busied himself from two of the clocke in the afternoon till foure, in climbing long ladders to stick up wax Candles in the said Cathedral Church. The number of all the Candles burnt that evening was two hundred and twenty, besides sixteen torches: sixty of those burning tapers and torches standing up, and near, the High Altar . .’ ” (id.) “A writer to the Gentleman’s Magazine in 1790 noticed at Ripon that ‘the Collegiate church was one continued blaze of light all the afternoon, from an immense number of candles’. Today, in all Roman Catholic churches, and in some Anglican ones, the feast of lights is remembered, and there is much blessing and processing with tapers . . Snowdrops are ‘Mary’s Tapers’ – ‘Candlemas Bells’. They are the day’s particular flower”. THE CANDLEMAS QUEEN. (Farrar, Eight Sabbats, p. 66) “Imbolg, 2nd February . . In Christian tradition, the Crown of Lights is often worn by a very young girl, presumably to symbolize the extreme youth of the year”. “The High Priestess selects two women witches who, with herself, will represent the Triple Goddess-Maid (Enchantment), Mother (Ripeness) and Crone (Wisdom) – and allocates the three roles. Groundhog Day. (Druids Cal.) “February 2nd: Groundhog Day. ” (Fell. of Isis Dir.) “February 2nd: Groundhog Day. Down to Earth for growth”.